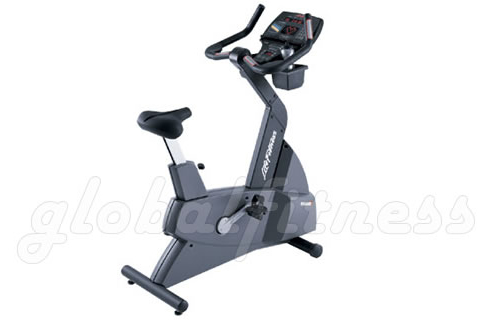 Enhanced workout programs and new ergonomic features make the premium Life Cycle 9500 HR a top choice for fitness enthusiasts and health clubs alike. In addition to Quick Start, Interactive Heart Rate Zone Training®+, and 25 different resistance levels, the 9500 HR even comes with a Race Mode Option for serious exercisers. Handlebars are also geared for racing and come with webbed forearm supports. The 9500 HR operates using a smooth, belt-drive system that is quiet and virtually maintenance free. Check your heart rate with wireless Polar® hands free heart rate monitoring or Lifepulse™ Digital Contact Heart Rate grips. Stay informed on other elements of your workout with the large, 16-character scrolling message center. Other useful features include a convenient, dual, deep pocket accessory tray, an integrated reading rack, and 11 "wide-ride" pedal adjustments. The Comfort Curve seat can be positioned 26 different ways. This self-powered unit weighs only 107 lbs and can go anywhere in your home or fitness facility.